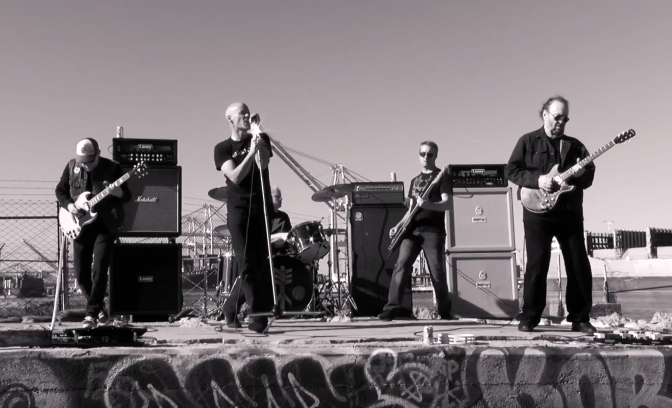 When Oakland, California’s brazen bastions of blues-infused rock music, BLACKWÜLF, unleashed their ‘Sinister Sides‘ album via Ripple Music earlier this year, fans of underground music took notice. Rightfully so, too because the band – Alex Cunningham, Pete Holmes, Scott Peterson, and Dave Pankenier – delivered yet another tempest of swaggering rock ‘n roll as only they can. At the time, people were also quick to take notice of a very special guest that was featured on the album, former Pentagram guitarist / drummer Geof O’Keefe (also of Bedemon fame). One of the tracks that O’Keefe contributed to was BLACKWÜLF‘s rendition of the Cream classic “Sunshine Of Your Love“, which the pairing have now released an official video for also. In the song, and its subsequent visualizer, you can hear this collaboration’s magic working in every note as the guys instill an abundant amount of doom heaviness into this classic tune. O’Keefe’s own non-stop assault of guitar injections alone is enough to astound but here, bolstered by the band, things are just incredible to both hear and behold. Check out this stunning reinterpretation of this vintage song below, along with a stream of the ‘Sinister Sides‘ album from BLACKWÜLF, in case you missed it or just need a nudge to revisit.